Today I listened to an interesting story on Noah Rasheta’s podcast, “Secular Buddhism.” He had been communicating online for over a year with a work associate in China named Chris, whom he had never met in person. On a trip to China, Noah made arrangements to meet Chris. Arriving at the location but not seeing Chris, he walked around a bit, returning to the particular table where they were to meet several times. Eventually he sat down at one end of the table. Two women were sitting at the other end. One of them spoke asking him, “Are you Noah? I am Chris.” In that awakening moment Noah realized that his preconceived idea/story of who Chris was, was not reality. He had created an image of Chris that was not accurate. Last night I had a phone call with a friend of mine in Las Vegas, who has recently completed a master’s degree in pastoral theology. I shared with her the faith journey I have traveled in the past year. She encouraged me to read the story about Jesus and his disciples on the road to Emmaus, found in Luke 24:13-35. Coincidentally, this is an additional account of someone (two disciples) not “seeing” or recognizing someone (Jesus) even though the person is right in front of them. What kept these two disciples (verse 16) from recognizing our Lord? Perhaps Jesus did not look the same in his resurrected body as he had in his mortal body. Perhaps there was a veil placed on the disciples eyes/minds for the purposes of the journey. Perhaps Jesus had a hood on his head that obscured his face, as is often depicted in videos. Perhaps they thought he was still dead and his body had been moved or stolen. They were not expecting a living, resurrected Jesus and especially not expecting him to be walking with them on what might be considered an inconsequential walk from Jerusalem to Emmaus. Was it their belief that he was dead (which they might have witnessed first-hand) that prevented them from seeing him in a different realm? They knew the current events but did not know the prophecies regarding the current events, or they had not linked the past and the present just yet. Jesus schooled them on the road. What an awakening it was to have the prophecies explained by the Master Teacher. They begged him to stay with them and he obliged. In the breaking of the bread they “saw” him. Is that not our goal also, to “see” God and be one with God? We are asked to do this by seeing God in our fellow beings. Are we seeing God? Is our story about God so rigid that we don’t see God when God is right in front of us? Where do you see God? During the past year I have reached outside the box of Mormonism for my own mental health. I was so absorbed in the wrestle that I became bitter and frustrated. Interestingly enough, one of the meanings of the name Maureen is bitter. (I never found that amusing.) Sometimes, I need to change the channel. One peaceful channel for me is mindfulness and trying to be in the moment. Part of that involves “seeing” things as they really are, instead of through our lens or created story. In an attempt to feel close to my deceased family members I sometimes attend mass or contemplate my long family heritage of Catholicism. We in Mormonism often reference our multi-generational heritage in the church. I wonder how far back my Catholic roots go. I’ve only gone back to the 1700s but my German ancestors did not convert to Lutheranism. It might be that my heritage goes back many centuries or millennia as a Catholic. I’ve submitted all the names and participated in many vicarious ordinances on their behalf. Yet, I still feel close to them sitting in a quiet, Catholic church. Why is that? Is it because I can “see” how they worshipped? Or is it just a reminiscence of my childhood, attending mass with my family? My friend, who called last night, told me I was in the desert, walking. It is a place you go to let go of encumbrances and meet God. Maybe my encumbrance is the image I have created of God. It might take a while in the desert. God might not look like the mental picture I’ve created. God might be talking to me through my friend, reassuring me that I am on a path designed specifically for me. In April I was visiting my daughter who was 14 days past her due date with her first child. 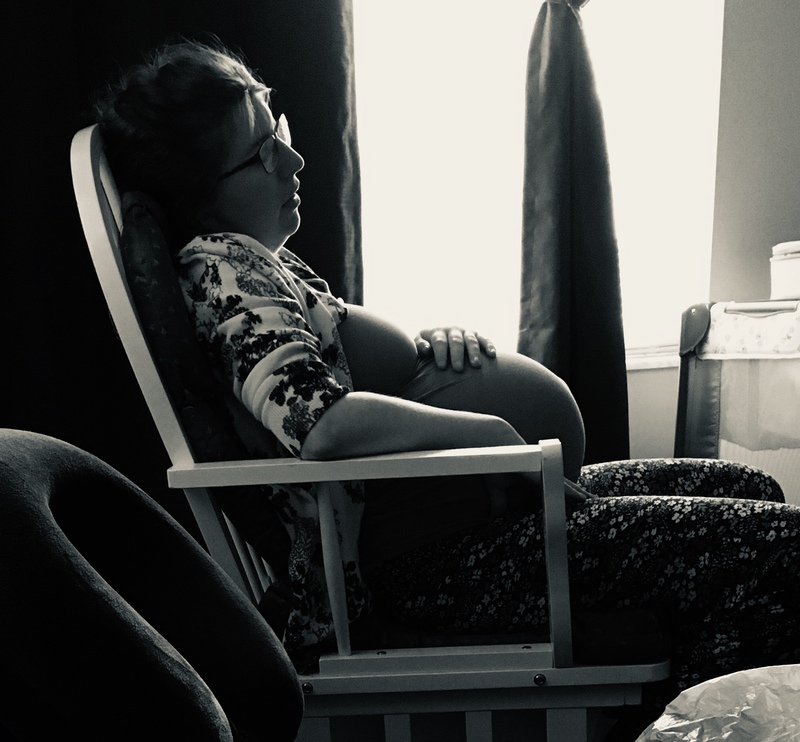 On this last day before the birth of her beautiful baby, the pain, fatigue, frustration and discouragement were palpable. There was no joy. She just needed this part to be over. While she was lying down in another room, I knelt down on the floor and audibly cried out to “Heavenly Father, Heavenly Mother, Jesus, Mom, Dad, Aunt Rosemary, Phil (my deceased brother), all who care about us: We need you now. We need your help and strength. We need this labor to begin and we need it now. Please!” I was still kneeling when my daughter came to tell me she had begun the process (sparing you the details). In that moment my view of God expanded. I can’t articulate fully the envelopment of love and support I felt from my God/family at that time. I “saw” God in that moment, not with my eyes but in my heart. Has your image of God changed over time? How do you honor the religious/spiritual traditions of your heritage that are not LDS? What can we see from the mountaintop? I loved this, Maureen. Thank you for giving me something to ponder. Thank you so much for this. I see God in many things. Today it is in face of my faithful GSD who I have to have put down this evening. It is in the years of love that have passed between us. Thank you for this article and your insights, Maureen. The Spirit drive Jesus out into the desert to prepare for his public ministry. Maybe you’re exactly where you’re meant to be right now. Also, great images of the communion of saints — the Ellis/Houseman family variety. I am thinking of you this weekend following the death of your cherished GSD companion. Peace to you.